This tutorial will show you how to run a Latent Class regression model in Excel using the XLSTAT statistical software. What are latent class regression models? Use XLSTAT-LatentClass latent class regression to identify latent segments differing with respect to the estimate of importance attached to each of the three attributes, which influence an individual’s purchase decision. The Latent Class regression model allows for the fact that these estimates may differ for different segments. That is, for one segment, price and only price may influence the decision, while a second segment may be influenced by quality and modern appearance, but is price insensitive. 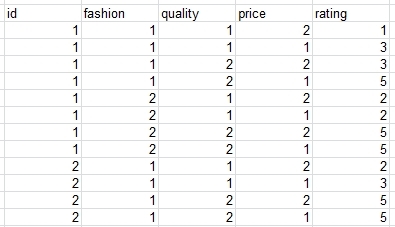 We will treat RATING as an ordinal dependent variable and compare several models to determine the number of segments. 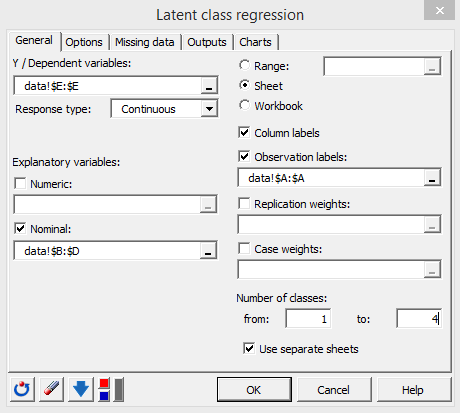 To activate the XLSTAT-LatentClass regression dialog box, select the XLSTAT / XLSTAT-LatentClass / Latent class regression command in the Excel menu (see Figure 2). 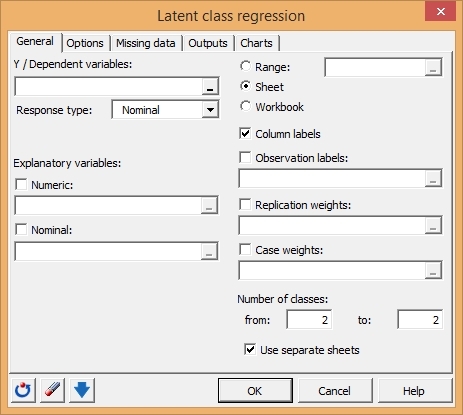 Once you have clicked the button, the XLSTAT-LatentClass regression dialog box is displayed. Check the box for ‘Observation labels’ and then in the corresponding field, select the variable ID. When XLSTAT-LatentClass completes the estimation, 5 spreadsheets will be produced – a Regression Summary sheet (Latent class regression), and a sheet for each of the latent class models estimated (1-class model (LCR-1 Class), a 2-class model (LCR-2 Classes), a 3-class model (LCR-3 Classes) and a 4-class model (LCR-4 Classes)). Note that PRICE has more or less the same influence on all three segments. The Wald(=) statistic indicates that the differences in these beta effects across classes are not significant (the p-value = .67 which is much higher than .05, the standard level for assessing statistical significance). This means that all 3 segments exhibit price sensitivity to the same degree. This is confirmed when we estimate a model in which this predictor is specified to be class-independent (check the corresponding option under the Options tab). The p-value for the Wald statistic for PRICE is .000 to 3 decimal places. Clicking on this value we see that the p-value more precisely is 2.4x10-106 indicating that the amount of price sensitivity is highly significant. Copyright ©2015 Statistical Innovations Inc. All rights reserved.